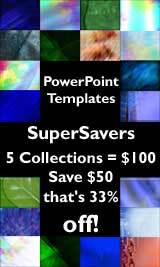 Click on any of the thumbnails to see the page for a particular collection of PowerPoint templates and backgrounds. In all collections, templates and backgrounds are available in both standard and wide screen sizes. All sets are included as readymade PowerPoint templates as well - so that you can use them immediately after purchase and download. You can download a free sample set from the 'Simply Azure' collection - follow this link to download. Don't all PowerPoint templates look the same? Like mass produced patterns from a mimeograph? Do you want to add the 'wow' look to your digital presentations? A look that's avant-garde, or maybe just poetically simple? Do you want some designs to fill in a void - something that's different, yet not distracting? Ppted is a series of backgrounds and templates - for use in presentation programs like PowerPoint. Ppted is promoted by Geetesh Bajaj of indezine.com. Ppted as a series is different from other such offerings in the same way as professional designs are different from clip media. The essence behind Ppted proclaims that if you are individual, your designs need to be distinctive as well.